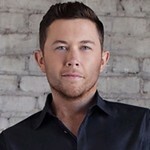 This May will be eight years since country crooner Scotty McCreery edged out fellow Nashville singer Lauren Alaina to win the 10th season of American Idol. The Garner, North Carolina native made quite a splash after winning Idol in 2011. His freshman release 'Clear As Day' debuted at number one on Billboards Top 200, and subsequently topped the charts on four separate music charts. His first two singles, 'I Love You This Big' and 'The Trouble With Girls' both cracked the Top 20 eventually earning 'Clear As Day' platinum status (more than 1 million units sold). Impressive for a young man who was just 17 years old at the time. Even McCreery finds it all too surreal. "The ride has been awesome. I've certainly been blessed. God had a plan for my life, and thankfully for me it included singing as a career." His parents and grandparents encouraged his love for music. By age ten he was playing guitar. "I was fond of country music, especially the legends like George Jones & Merle Haggard, but everyone knows by now I was drawn to Elvis Presley. That seems odd for a kid who grew up in the 90's and 2000's, but there is something about Elvis that hit a chord with me. He's my number one." A devout Christian, McCreery travelled to Milwaukee in 2010 to audition for Idol, forgoing a closer trip to Nashville because it interfered with a planned church camp. Prior to the audition he had success in his hometown and was a youth praise leader. "I went to Milwaukee not thinking much about it. I had watched the show my whole life and when I was old enough to try out I went for it. I had no expectations. I thought I'd have fond memories and stories I could share with my friends." Nevertheless the good Lord's will prevailed and he was invited to Hollywood. "When I made it to Hollywood I told myself I'll try hard and if I don't make it I'll have even more stories I can tell people later in life. The cool story is they kept me around. I made the top 24. That's when you start second guessing because there is really a lot of talent at that level. And then I reached the top 12 and top 10 and it starts to hit you. You're hoping to win but rooting for fellow contestants because you've made friendships." In May 2011 it was down to 16 year old Lauren Alaina and 17 year old Scotty McCreery. Their combined ages make the youngest match up in American Idol history. When his name was announced McCreery became the youngest male to ever win the competition. "It was a very nerve racking time. Again your hoping for your opponent and wishful for yourself. Thankfully Lauren has had success in country music. We are close friends and I'm happy for her." McCreery rolled into 2012 with gusto. He picked the Best New Artist at the ACM Awards, spending most of the year opening for Brad Paisley, before putting out a Christmas album that went gold before the year was up. 2013 kept the McCreery train rolling adding Breakthrough Artist of the Year at the ACM's. His single 'See You Tonight' from the album of the same name gave him his first Top 10 hit, with the follow up 'Feelin' It' charting the same path in April of 2014. But a little dry patch forced him and his record label to part ways in 2017. Not deterred McCreery decided to use modern technology to reach his fans. Although he had signed with Triple 8 Management, and still without a label to back him he released 'Five More Minutes' to digital retailers. Radio and fans embraced the song written after the loss of his grandfather, propelling the single to number one. It's the first ever single to reach the top spot without the support of a record label. "That's pretty amazing." Still McCreery believes he has a higher power watching over him. He did eventually sign with Triple Tigers Records (division of Sony) which helped 'This Is It' reach number one off his 2018 album 'Seasons Change'. The title appears to reflect how he has evolved in the entertainment industry at a young age. He co-wrote all 11 tracks on the release. "This album is much more personal than the others I recorded. I enjoy song writing because I can connect to the songs better." McCreery admits many things changed in his life in 2018. "The biggest thing that took place was getting married." He and his long time girl friend Gabi Dugal tied the knot on June 16, 2018. "Married life is good. She makes me a better person. We're coming up on my first anniversary. So that's cool. And we bought a house and got a dog recently. Life is really good for me right now, especially since the album is doing well and the singles went to number one." Although he's just 25 McCreery has experienced quite a bit. "I realize I'm still young but I've put out four albums, had success on the radio, toured the country, got married, and now I'm a homeowner. I'm very thankful for all I've achieved since winning American Idol." He feels very blessed since that fateful day in May 2011, recalling many milestones over the past eight years. "When you consider all the people who try out every season for American Idol, and the chosen few that move on to Hollywood you can't help but feel blessed. American Idol allowed me to take what I love to do, which is sing, and helped jumpstart my career. I will forever be thankful to them and the fans who voted for me. I've been seeing those same fans over the past eight years at concerts." Since then he's been racking up career milestones. "I went on tour with American Idol after season 10 ended, and toured with Brad Paisley in 2012. I did shows with Kenny Chesney and have performed with some of the icons in country music today, and the Opry stage. I don't take any of what I've been able to do for granted." He still has bucket list items. "There are always artists you want to write or record with. I'd love to work with Dolly (Parton) or Loretta Lynn. They are trailblazers and artists I admire." 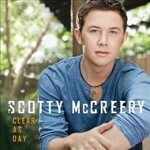 There is much to like about Scotty McCreery. A young and focused country music artist, he received the Order of the Long Leaf Pine in 2017, the highest civilian award you can earn in North Carolina. His reach has spanned beyond country music. His 2018 'Barefootin' song which he co-wrote with David Lee Murphy and Frank Rogers, was named the winner of the 2018 Carolina Beach Music Award for National Song of the Year. "That's one I never expected. If you live and are raised in the Carolina's it's only natural you're going to be exposed to beach music." He hopes to be able to shag to his hit song in the future. 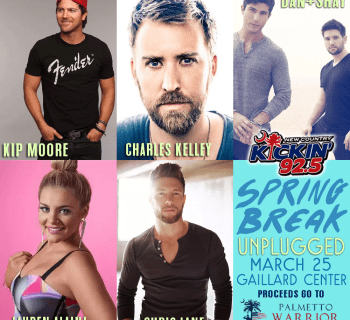 Although he continues to tour and open for more established artists, he does headline smaller venues, and will come to Charleston SC with Lauren Alaina to perform at the Hanahan Amphitheatre on Thursday April 18th. 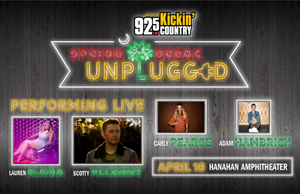 It's part of 92.5's Spring Break Unplugged concert series. "I love playing in the Carolina's and closer to home. I also love sharing the stage with Lauren. We have so much history together and she's just a really nice person." 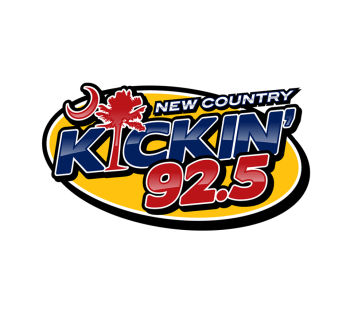 McCreery's appearance here in the low country comes less than two weeks after he took part in the 2019 ACM Awards in Las Vegas the weekend of April 5, where he participated in one of four 'Party For A Cause' charity raising events, which teamed him up with Charleston native Darius Rucker. "Darius is the real deal. He's a great guy and I love his music. He and I are hosting a golf tournament, so that should be fun." The ACM Party for a Cause events support ACM Lifting Lives, the charitable arm of the Academy of Country Music. 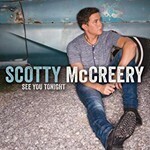 Low country fans who want to see Scotty McCreery can buy tickets to the outdoor show at the Hanahan Amphitheatre for his April 18th concert. He will there with Lauren Alaina and newcomers Carly Pearce, and Adam Hambrick. According to McCreery it's a strong line up. "Should be a good show." Pearce's debut single, "Every Little Thing", peaked at number one on the US Country Airplay chart in 2017 and she is an Opry veteran. Hambrick is gaining momentum with his first single, 'Rockin’ All Night Long'. Alaina has placed seven singles inside the Top 40 on various country music charts with 'Road Less Travelled' off her second album of the same name topping the charts in 2016. 'Georgia Peaches' off her debut release 'Wildflower' continues to be a crowd favorite. Country music fans will have an opportunity to witness four of today's rising stars on April 18th. You won't want to miss it.